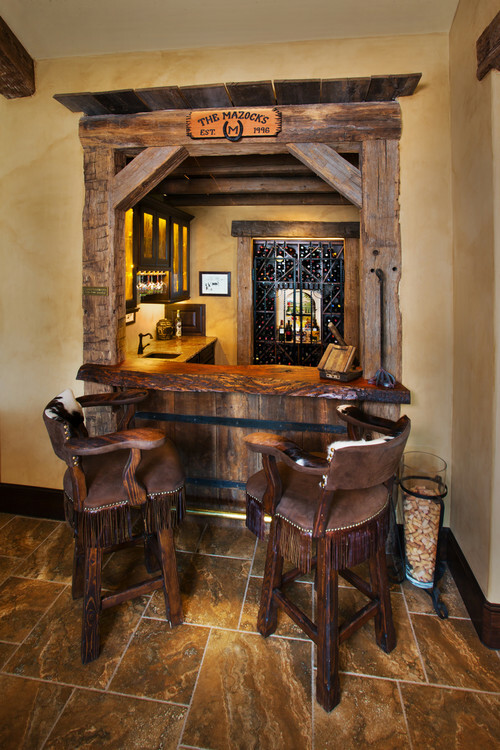 We love the gorgeous, dark wood used on this bar, which the designer says is knotty alder. 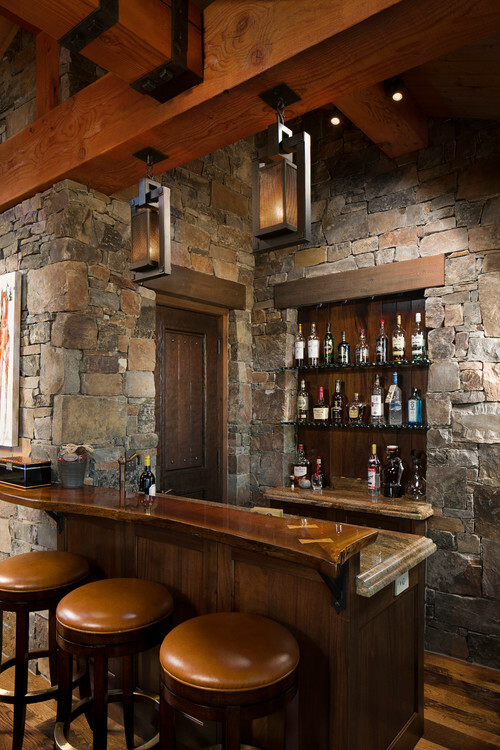 The deep, rich finish of the bar contrasts with the light-colored carpeting and quartzite flooring to make this bar feel cozy without being cramped. 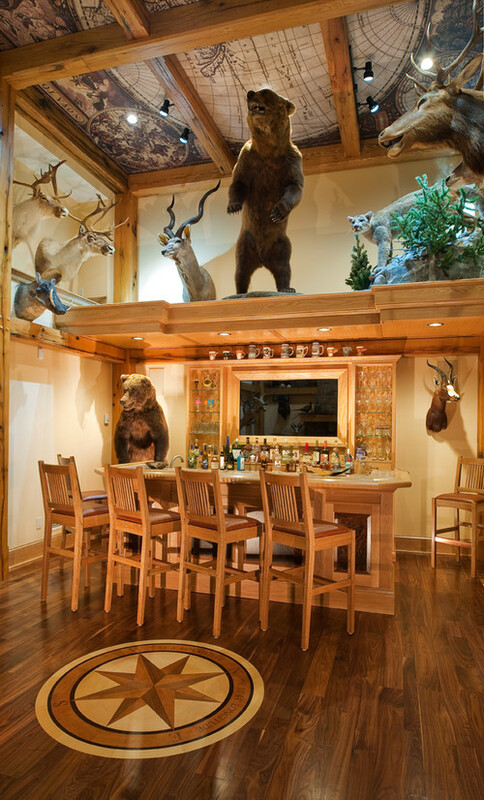 The high ceilings, bar front inlays, the custom map inlay on the ceiling – What’s not to love about this home bar? And the compass inlay in the wood floor adds an extra-special custom touch to this room. Check out all the other photos on this project to see how the whole room came together. This is such a fantastic use of a small space to carve out a unique home feature. Collecting all your wine corks in a beautiful vase is a great way to keep memories of the fun and good times you’ve had at your home bar. This modern, minimalist home bar would fit in with a mid-century modern home just as well as an ultra-sleek contemporary design. 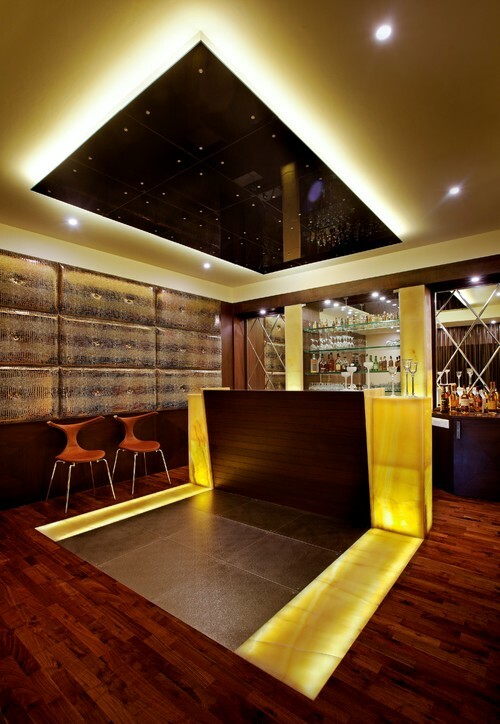 We love the lighted columns on either side of the bar top to add a warm, inviting glow. What goes better when your favorite drink but a tasty snack? 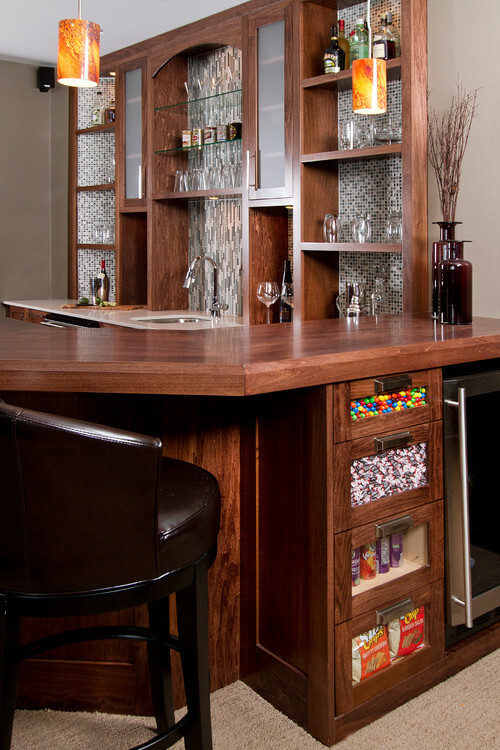 Our favorite part of this home bar is the glass-front snack drawers, so you always know what you have in stock. 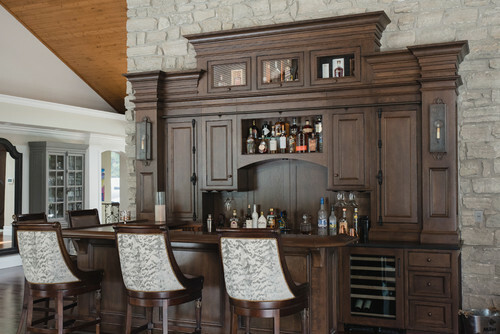 There’s also plenty of cabinet space behind the bar to store everything you need for entertaining. 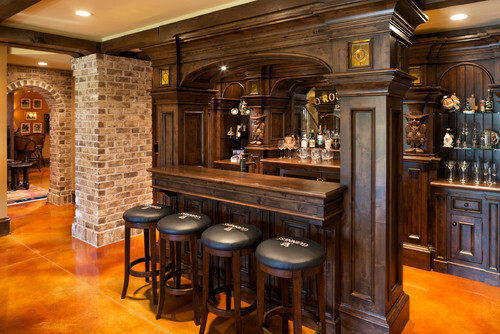 The unique, natural slab shape of this bar top gives this home bar the feel of an old British pub. And we can’t get over how amazing the flagstones on the walls look in this small space. 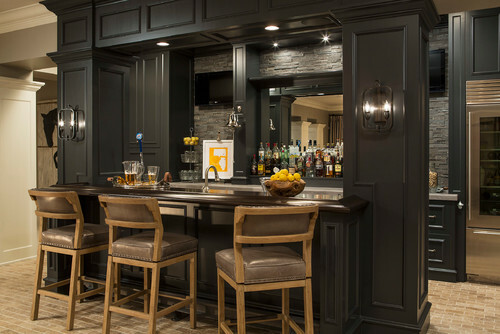 The paint colors and sleek lines on this home bar give a contemporary feel to a traditional bar design. The unique wall sconces and custom bar stools really put this one over the top! 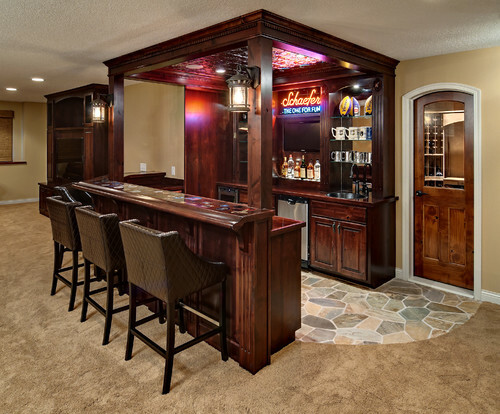 This large home bar would have plenty of room for all your friends! We especially love all the display shelves for showing off your favorite glasses and knick knacks. This bar really gives the feel of having a true Irish pub in the basement. The carved leprechauns inlaid in the back wall are a truly unique touch that we can’t resist. 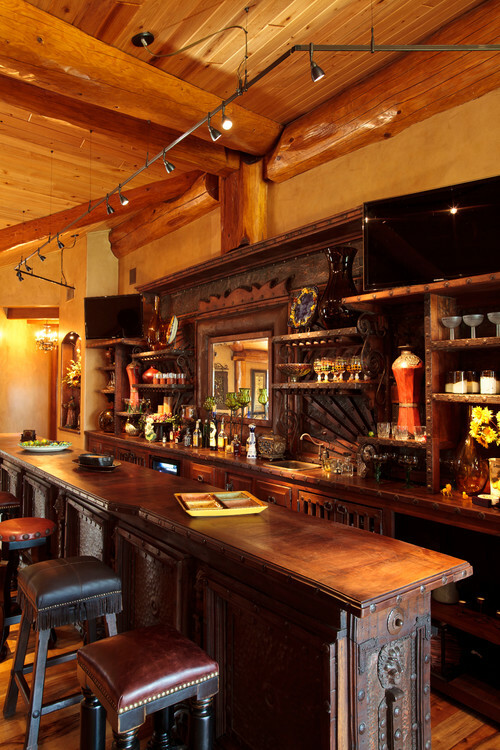 The high ceilings and natural lighting make the dark wood of this bar feel warm and inviting instead of overwhelming. Check out all the other photos of this project to see some amazing extra features!